Limerick has a long and vibrant history and has witnessed huge changes in the last two centuries. These changes have been captured in Sharon Slater’s Limerick – Ireland in Old Photographs. Through the 128 pages of the book she shows how the city has grown, recalling shops and industries, streets and buildings, societies and clubs. Through this book historian Sharon Slater brings back a lost way of life. 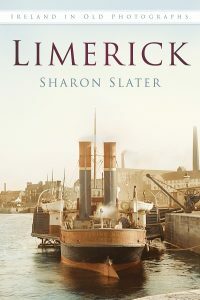 The book is split into eight chapters covering themes such as sporting life, childhood, famous visitors from around the world, life on the Shannon River and the catastrophic Todd’s Fire. Each of the over 200 images is followed by a detailed caption, setting the scene for the captured moment in time. Some of these photographs came from as far away as Germany and America, dating as far back as the 1880s and covering over 100 years of life in Limerick. From the first to last page of this little treasure trove of visual history, faces of individuals from junior hurling teams to visiting royalty come to light. While lost scenes of former leisure spots, such as the Corbally baths and the old park in St. Mary’s Parish, and peeks into businesses like Matterson’s bacon factory to grand ships on the docks reappear. This book would not be possible without the generosity of individuals and institutions who granted permission for their images to be reproduced in this publication. Published by The History Press as part of their Ireland in Old Photographs series, Limerick – Ireland in Old Photographs, is already on the shelves in Limerick’s bookshops and online at History Press or Amazon. NextThe Grand Prix Races of the 1930s in Limerick.